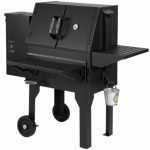 You want find another Pellet Grill in this price range with the quality and wifi option making Green Mountain Grills one of our top choices for pellet grills. We really love Green Mountain grills. 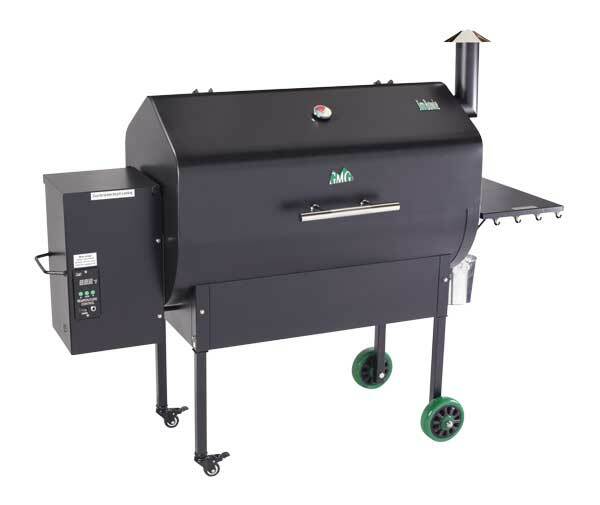 They have always made some of the best Pellet Grills and within the last few years they have lowered their prices making their pellet grills once of the best options in the industry. 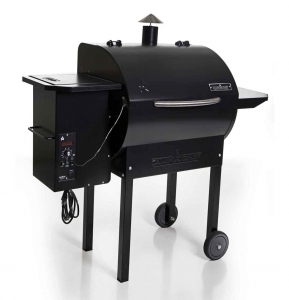 The Jim Bowie model is their largest residential pellet grill model and offers some fancy extra features such as wifi control, dome thermometer, and stainless steel hoods. You want find another Pellet Grill in this price range with the quality and wifi option making Green Mountain Grills one of our top choices for pellet grills. One of the absolute best options about Green Mountain Grills is the optional upgrade (Approximately $100) to have wifi control of your pellet grill. The range is approximately 100 feet and makes grilling, smoking, and baking in your pellet grill super easy. 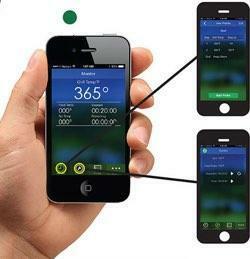 You can view your cook times, grill temperatures, and internal meat cooking temperatures all from your smart device. You can also adjust the cooking temperature, set timer alerts, and alerts when your food’s internal temperature reach a certain level. The control head for Green Mountain Grill’s Jim Bowie Pellet Grill is sturdy and simple to use. With an easy to adjust temperature control and a digital readout it is easy to set your cooking temperature. You can also plug in a meat probe to the controller (Not needed with upgraded wi-fi option) and pressing the food button will show the internal meat temperature. Another awesome feature of Green Mountain Grills is the “turbo mode” feature. Once your outside temperatures drop below 35°F (2°C), the Turbo mode kicks in to accelerate the volume of pellets and air so that you do not have to wait so long for the grill to heat up as you otherwise would without it. Green Mountain Grill’s pellet hoppers are equipped with a low pellet alarm. When the level of pellets falls below this sensor, an alarm sounds to let you know that you need to fill the hopper back up. Once this alarm goes off, you have approximately ½-3 hours before the hopper runs dry. Tests from users have indicated that you can reduce your pellet consumption by 40-50% in very cold weather by using a GMG thermal blanket. If you do not plan to use your grill frequently in the wintertime, then you should probably save the money. The Thermal Blanket for Green Mountain Grill’s Jim Bowie Pellet Grill is approximately $89. With 658 inches of grilling rack space, the Jim Bowie Pellet Grill is perfect for both large and small families. Digital Controller: Control your grill’s temperature from 150′-500’F (66′-260’C) in 5′ increments. From smoke to sear, you will have unparalleled accuracy, winter or summer. Efficient Firebox: The firebox has vertical grooves cut evenly on its sides so that the air “whirlwinds” around the fire and gives much more complete combustion due to increased air circulation. This “cyclone” effect means more efficient pellet usage. Peaked Lid: The peaked lid lets you cook a turkey or a beer-can chicken without the cover touching it. Sense-Mate Dual Program Control: Circuit-board-mounted sensor reads outside air temperature and sends computer program into turbo mode so that you won’t have to wait long for the grill to get up to temperature when it is very cold outside. Perfect for winter grilling! Low-Pellet Alarm: When the pellet level gets down toward the bottom of the hopper, the grill sounds an alarm to let you know so that you can have uninterrupted grilling. 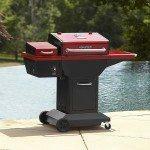 Front Casters: Locking front casters make moving your grill a breeze! Remote Control: Upgrade to the remote model and enjoy total control and information from inside the comfort of your home. The RF transceivers negotiate walls, windows, trees, etc., up to 100′ away. Perfect for blistering heat or brutal cold! And the low pellet alarm even chirps on the remote handheld device to let you know if you’ve run low on fuel! Upper rack for increased smoking area. A Dome Thermometer to monitor interior temps. We are independent professional comparison site supported by referral fees from some of the products and the sites featured. We do not let this affect our honest reviews of products. The sites and advertisements that we present are from companies from which we receives compensation. We are able to provide this free comparison tool thanks to compensation we receive from some of the companies on this site. We do not provide information about every available service or product in each particular niche. Although we confirm the information we provide frequently, it should be noted that all information should be confirmed with the website or company reviewed as they can change their rates, discounts, processes, and all other information we have provided at any time.